When you first walk in, you’ll be taken by how dark it is inside, but once your eyes adjust, the lighting feels rather perfect. The interior features slightly upscale Italian decor that is inviting and might leaving you feeling a bit like you’re having dinner in a nice Italian villa. Yes, the atmosphere is bustling, but the noise doesn’t get out of control so conversations are easy. 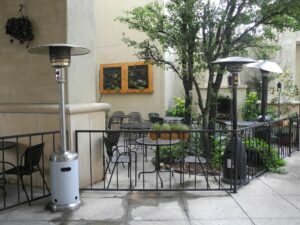 Outside is a comfortable and well-shaded patio adjacent to Bonnie Ruth’s including a small water fountain and fireplace making the patio the ideal place to sit on a nice evening… especially with a good bottle of wine. We’ve eaten at TruFire many times and never once been disappointed in the food. Everything from their appetizers to dessert is excellent. 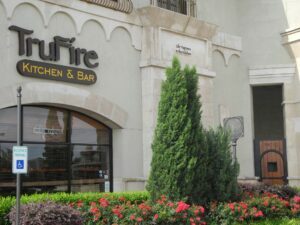 TruFire describes their cuisine as American in concept, but including Italian, Mediterranean, and global influences. We tend to zero in on the Italian, but there are definitely other gastro-regions represented that deliver an interesting variety of flavors. Whether you’re in the mood for Mediterranean style cuisine, pasta, pizza or a steak, they’ve got you covered. Specialty Items: Let’s say you can’t go wrong here but, if you don’t try the TruMac, you’re missing out on one of the best dishes anywhere in Frisco. How about: roasted garlic butternut cream sauce, aged white cheddar, goat cheese, apple wood bacon, cavatappi pasta with parmesan cheese crust, mist of white truffle oil. TruFire has a reasonably varied and well-priced wine list, though it is not the most extensive we’ve seen (hint: If anyone from TruFire reads this, add an Amarone, please? Thank you!). The service has always been good, but it does get busy in the evenings, so we recommend reservations. Otherwise, go enjoy the bar and some of their signature cocktails.